The Galaxy Tab is to land in the UK 1 November, Samsung has confirmed. The Android-toting rival to the iPad is going to be available in UK stores a month from today and represents a new category of mobile products for the company. Speaking about the impending launch of the Galaxy Tab, Simon Stanford, managing director for Samsung mobile in the UK, said: "At Samsung we recognise consumers want to experience life without limits. "The Samsung Galaxy Tab brings a very unique proposition to the tablet market and from 1 November, gives consumers the ultimate in connectivity." The Galaxy Tab runs Android 2.2 (FroYo), features a 1GHz processor, has a 7-inch TFT-LCD display and will run Flash 10.1. 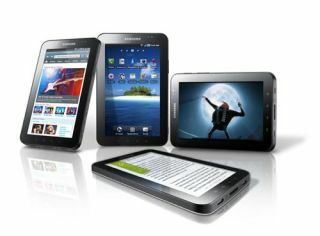 The Samsung Galaxy Tab will be available from Carphone Warehouse, Dixons, T-Mobile and a whole bunch of other retailers. Samsung also notes that it will be available at a number of different price points, so look out for subsidised deals. This comes after Amazon listed the Galaxy Tab as costing £599.99.